Mr Royalton Kisch of the British Museum in his catalogue writes that this drawing “exhibits lines of splintery angularity". But what we see is the sheer exhaustion of motherhood as well as the tenderness. The contented babe has sucked his mother dry. 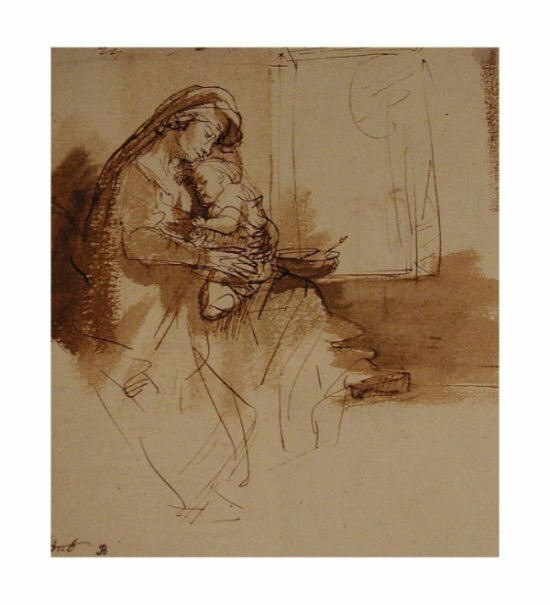 Rembrandt is telling us the truth about motherhood. We should be pleased and grateful for Rembrandt's observation. Mr Royalton Kish puts the drawing on the borderline of de-attribution, he is unable to see Rembrandt on his own human terms. In the three pages of the catalogue devoted to this drawing there is not a single mention of its human content. I would describe the lines with which this miracle of observation has been charted as amazingly varied. Those used for the baby have nothing whatsoever to do with angles or splinters. There is surprising variety in the quality of observation, from exquisite in the baby's head and right hand, to just plain feeble, in the case of the mother’s right hand. The hand is so prominent and so wooden as to almost overshadow the superb quality of the rest. That’s Rembrandt, an unreliable genius. The hand has probably misled Mr. Royalton Kisch into thinking this drawing is not a Rembrandt. A probable explanation for the unfeeling quality of this hand is that it was in constant movement tending the babe as Rembrandt drew.